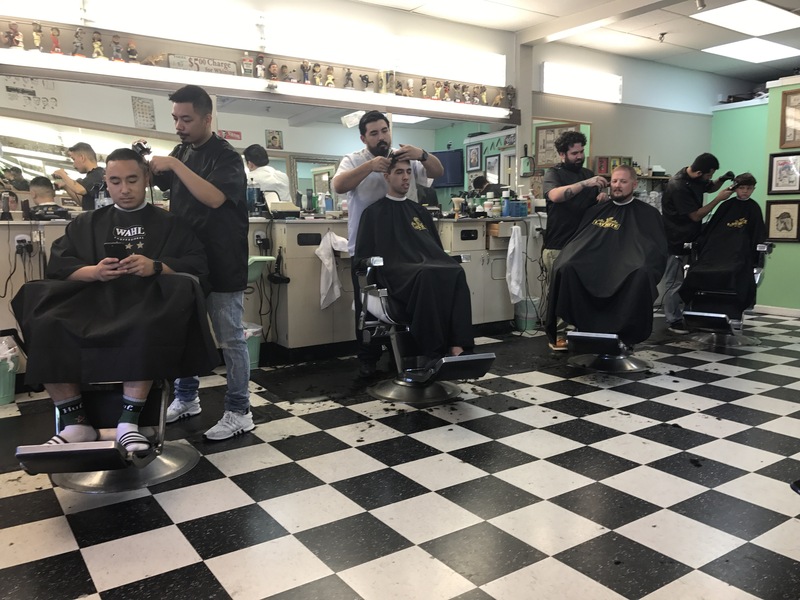 Five chairs, five barbers, six guys sitting waiting. Two guys outside sitting on the back of a pick up truck smoking. Another 8 names on the sign up chalkboard, who may or may not return before I get called. This is the Walnut Creek Barber Shop and Shave Parlor. Not too many places to get a shave these days, or men taking the opportunity. Just a steady stream of young and old getting cleaned up for the weekend. The barber uses Equinox International professional razors. Gail has a schedule and a system. She goes to see Eric for her hair, and makes her next appointment before she leaves. I wait until I look in the mirror and decide I need to get a cut, then spend a week or three forgetting until I’m dreadfully shaggy. Then I have to wait because this place doesn’t take appointments. My grandfather was a barber, so I have some genetic attraction to the rituals and artifacts of the tonsorial trade. The time I spend here is a friendly, masculine, semi-anonymous respite while still being productive. Shaggy is not a good look on me. Only one woman in here, bringing her 5 year old son. She sends him up to the barber with her phone which has a photo of how the kid shoud look. The barber places the booster seat across the arms of his chair and goes to work. I don’t think there’s a lollipop in his future the way it used to be. Lollipops have gone the way of Bay Rum after a haircut. The chatter is a constant flow of sports commentary and male persiflage. Clients are welcome to join the egalitarian conversation. Waiting mothers are almost always silent. In Walnut Creek, at least, there isn’t much talk of politics these days. There is a bar in the back of the shop where you can pour yourself a shot of booze if you like. Can’t say that I’ve ever seen anyone availing themselves of the chance. My turn comes and I climb into the chair, telling the barber that I want my hair to be a “4”, which seems to be some unit of measurement I’ve only recently heard about. The world changes and I never get the memo. 12 minutes later, I’m shorn and tidied. My eyebrows no longer are look like Andy Rooney’s, a straight razor has given me a clean line around the back of my neck and I’m ready for trouble. No senior discount on Saturday–everybody pays the same $25. It costs $65 to get the dog groomed, so I guess it’s a bargain. I leave a decent tip and head home. Saturday mornings can be just fine. I just love the glimpses you give into your life and current day Americana. Thanks! By all accords, today is Wednesday? Unlike the White House, this blog has a careful and thorough editing process. That takes time.